Experience many of the same benefits of a gymball. Use to perform lower back, pelvic stabilization, abdominal and weight shift exercises. Acts as a dynamic cushion to activate major muscle groups. 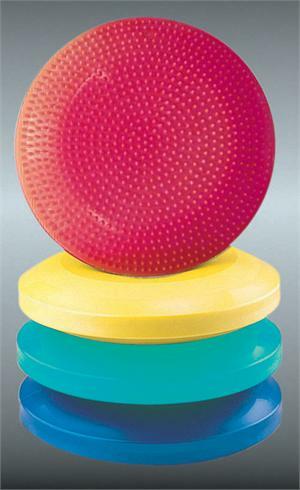 Use on the Floor as a standing disc for balance training, proprioception and strengthening of the lower extremities. Inflatable with a standard ball needle and pump. Can be deflated to 1 thickness or inflated to 2 thickness to vary the degree of instability. Each disc has one nubby side for tactile feedback and stimulation and one flat side. Available in (2) sizes; 35cm & 60cm.